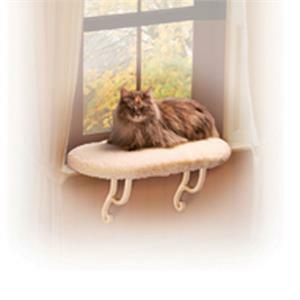 The Unheated Kitty Sill by K&H Pet Products is white and measures 14" x 24" x 9". It has incorporated advanced engineering for strength and ease of assembly, with an attractive oval design. "No tools are necessary for installation when using the provided hook and loop fasteners. Also included are screws for a more permanent attachment. Dimensions: 14"" x 24"" x 9""